Aloha and thank you for visiting our site! No Spray is a statement. Our mission statement is to provide our customers unique opportunities for education to inspire change. We strongly believe that we’re here at the right place at the right time and can make a significant impact towards the vitality of our future. 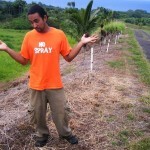 Read more about No Spray Hawaii founders. The vision of No Spray HawaiiTM is about increasing awareness and providing solutions with emphasis on teaching the kids. We realize that change comes from within so we’ve created a product line meant to invoke and appeal to curiosity, inspire questioning in a friendly welcoming way, and highlight our mission statement. We want people to stop poisoning the land so the future has the chance to feed themselves. No Spray envisions a future without the use of harmful chemicals on our food. Once we stop spraying poisons and start working with the microbes, we are able to increase the health and vitality of the land to be able to farm for the future! We plan to help increase awareness about the solutions available through the education of sustainable agriculture. Our education plan will be funded directly from our 20 percent program. For the Future: 20% of all of the profits from No SprayTM will be streamlined into our education plan and be used to fund the creation of children books, reference books and other how to informational guides. One of the most exciting initiatives being considered for the education plan is our work parties. The work parties take place at local all-natural upcoming farms, communities, and towns. Projects and tasks are achieved with the helping hands of many while the essence of community is maintained. 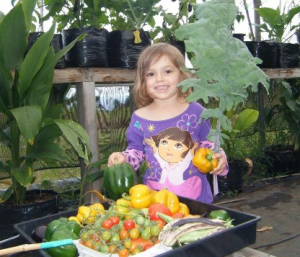 Natural, sustainable gardening techniques taught are practiced to ensure a healthy and happy future. Healthy, all-natural, ono-licious meals will be provided and eduction will be hands-on. 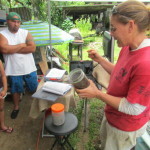 Another role of our education plan is to teach concepts through hands-on-classes about all-natural food producing techniques and practices. We teach WHY it’s important! One-on-one, information intensive with handouts, writing exercises, BUT HANDS ON!!! “Do while you learn and learn while you Do!” Other initiatives include the writing and publishing of the“Successful Natural Food-Producing/Gardening Techniques” book and regular postings of web-based-seminars (about composting, worm-raising, meat production, fish production, natural bug repellants, nitrogen-fixing plants and trees, microbes, many more) free, easy to understand, relevant information for all! 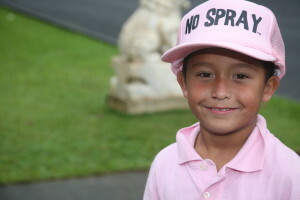 Read more about No Spray Hawaii founders. Similar Goals? Similar Views? CLICK HERE to learn how to connect / link / work with with No Spray.